A Chinese subsidiary of Amazon.com has registered to provide ocean freight services, a move that could help cut costs for Chinese companies looking to move products to U.S. markets, as well as give the retailer greater control over end-to-end delivery. 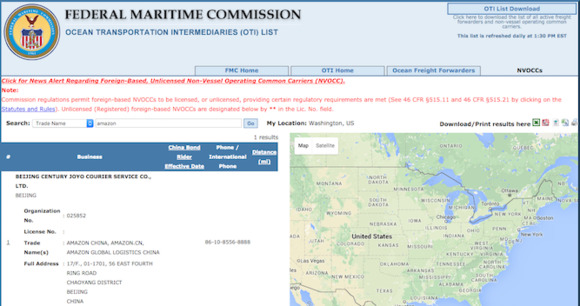 A listing of "Ocean Transportation Intermediaries" by the U.S. Federal Maritime Commission states that a business named Beijing Century Joyo Courier Service Co. Ltd, with the trade names Amazon China, Amazon.CN and Amazon Global Logistics China, was registered to provide ocean freight services. Amazon said in 2004 in a regulatory filing it had entered into a definitive agreement to acquire Joyo.com, a British Virgin Islands company, which operates the joyo.com and joyo.com.cn websites in cooperation with Chinese subsidiaries and affiliates. The Joyo.com websites are the largest online retailers of books, music and videos in China, Amazon said at the time. The listing on FMC, first noticed by Flexport, a logistics firm in San Francisco, could pave the way for Amazon to offer ocean freight services for other companies, particularly to Chinese companies, wrote Ryan Petersen, CEO of Flexport in a blog post. Amazon offers a Fulfillment by Amazon service which offers to "pick, pack, ship, and provide customer service" for sellers' products. By offering ocean freight services, FBA could make it easier for its customers to move goods into the company’s logistics network, according to Petersen. "Amazon China can provide freight forwarding services to Chinese companies looking to move products directly into FBA warehouses, or perhaps even by cross-docking the goods for direct injection into Amazon’s courier network," Petersen wrote. Amazon could also use automation to further cut down costs in the ocean freight services business, which now has labor as a key cost, Petersen said. "At the same time, fulfilling products directly from China to consumers in the U.S. will cut handling costs at U.S. warehouses," he added. Amazon did not immediately comment. 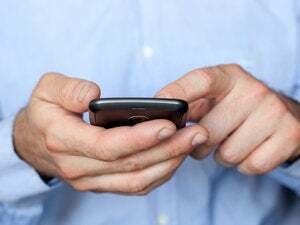 The company has been investing in higher control of end-to-end delivery, including planning to use drones to deliver parcels to customers, and hiring independent contractors to deliver packages through Amazon Flex, a program it has launched in some parts of the U.S. There have also been reports recently that the company is planning to lease jets to carry cargo and is also planning to acquire the 75 percent stake it still doesn't own in a French package-delivery company Colis Privé.